I seem to get the best advice from non-making-jewelry-craft people. As always, I look for cost effective ways to do what I do. I happen to watch Carol Duvall one morning and she suggested using fishing line to make my jewelry. Fishing line was much cheaper (but it tangled easy and was quickly discarded as a viable solution). While in the aisle look at the different colors, I met a gentleman who asked me what I was looking for. I gave him my explanation about making jewelry. He suggested I use a tackle box to keep my finding and some of supplies. He led me over to aisle and showed the different models and brands. Helped me pick out one (not this one. I destroyed the other out). This tackle boxes are great and compartmentalized. I naturally picked the cheapest one, and the lightest one. Everything fits. I carry it around with to all my shows. I can repair, make, redo right there on the spot. One draw back, it is terrible for beads, just terrible. I fixed that problem. I will string different kinds of beads to take along. I will usually have two of everything so that I can make a pair of earrings. In a pinch, I will dismantle a piece I already have. Now what might look like a mess to some; is organization to me. I have thought about making labels to give the interior a more polished look, but that is not my style. The inside looks like I have been working. Which gives the impression of creativity? I want my customers to see my handiwork. I want them to see the beginnings from the selections of pins, beads and hooks. To me it gives an air of euthenics to my work. I brought the process from the workroom to the table. I love it. Let me give you a glimpse of work my eyes and the eyes of my customers see when I am out and about. Tier’s 2 and 3 the 2nd tier is reserved for jump rings, chains. The 3rd tier is for hooks, extra wire and jewelry in the making. The bottom drawer is for extra wire, string, memory wire. 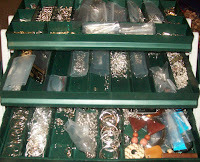 Bracelets and necklaces, tools, additional beads and anything I fit in there. There it is. 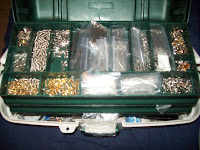 Inside a fishing tackle box, sits my jewelry life maybe one day I will use it for what is intended. I do like to eat fish.